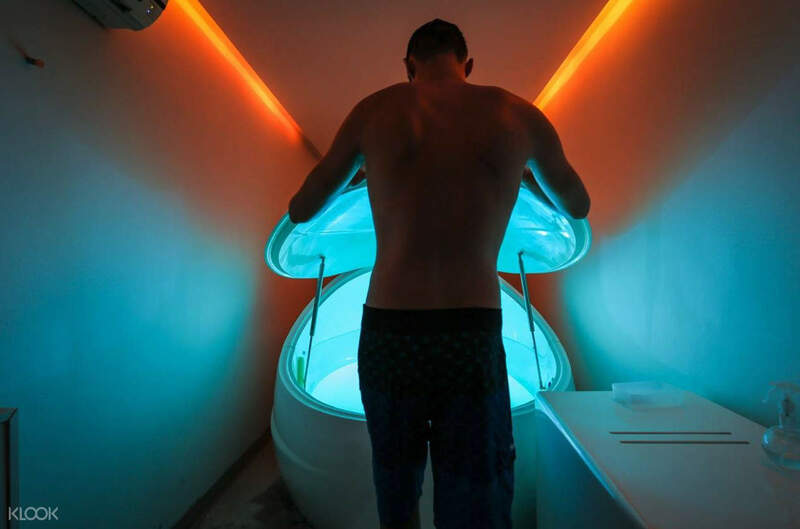 Experience at Hong Kong’s first sensory deprivation centre in Float on HK! Offering a truly unique experience especially for elderly couple over 60 yo. 5 star service for their prompt reply on WhatsApp :) The studio have 4 rooms each with their own salted tank so you get 60mins of quite tranquility! Studio is located underground so you have to walk downstairs. Floating sessions have become rapidly popular all over the world for its therapeutic benefits. Scientific studies have shown that there is something extremely soothing about being able to float in the water in perfect peace, silence, and isolation, calling back to how infants calmly floated during gestation, away from the stresses of the world. Floating pods have come to Hong Kong, allowing you to choose between 60-90 minutes of floating within your own pod. You'll be able to climb into the water and lay back to float and relax. The complete sensory deprivation offers you the ability to let the world's worries and stress fade away into the distance as you find yourself in peaceful isolation. First timers need not worry: there will be an orientation to help them get accustomed to the what to do within the pod. You'll find yourself emerging splendidly relaxed and at ease. Offering a truly unique experience especially for elderly couple over 60 yo. 5 star service for their prompt reply on WhatsApp :) The studio have 4 rooms each with their own salted tank so you get 60mins of quite tranquility! Studio is located underground so you have to walk downstairs. Offering a truly unique experience especially for elderly couple over 60 yo. 5 star service for their prompt reply on WhatsApp :) The studio have 4 rooms each with their own salted tank so you get 60mins of quite tranquility! Studio is located underground so you have to walk downstairs. This is my first floating experience. It is a very unique experience. I have a very active mind so I find myself rocking like a boat on water. It takes a while for me to adapt to the environment. I can feel my muscles more relaxed after the session. Excellent customer service. Tip: try to switch off all the lights to enjoy the session. This is my first floating experience. It is a very unique experience. I have a very active mind so I find myself rocking like a boat on water. It takes a while for me to adapt to the environment. I can feel my muscles more relaxed after the session. Excellent customer service. Tip: try to switch off all the lights to enjoy the session. The two girls there were really helpful explaining step-by-step so we could relax our first time! Quiet, tranquil, cozy space, I surprised my gf and she ADORED it. She fell asleep the whole hour and alleviated her back + shoulder soreness. I highly recommend as an activity with your date or for more frequent visits for therapy. The two girls there were really helpful explaining step-by-step so we could relax our first time! Quiet, tranquil, cozy space, I surprised my gf and she ADORED it. She fell asleep the whole hour and alleviated her back + shoulder soreness. I highly recommend as an activity with your date or for more frequent visits for therapy. I’d say it’s an acquired taste kinda activity. I’m Glad via Klook users can try it out. The water felt a tad too warm for my liking but overall interesting experience . I’d say it’s an acquired taste kinda activity. I’m Glad via Klook users can try it out. The water felt a tad too warm for my liking but overall interesting experience . very cool experience, awesome staff, but bath was a little cold. very cool experience, awesome staff, but bath was a little cold.